Click here to view all of our classes and programs. 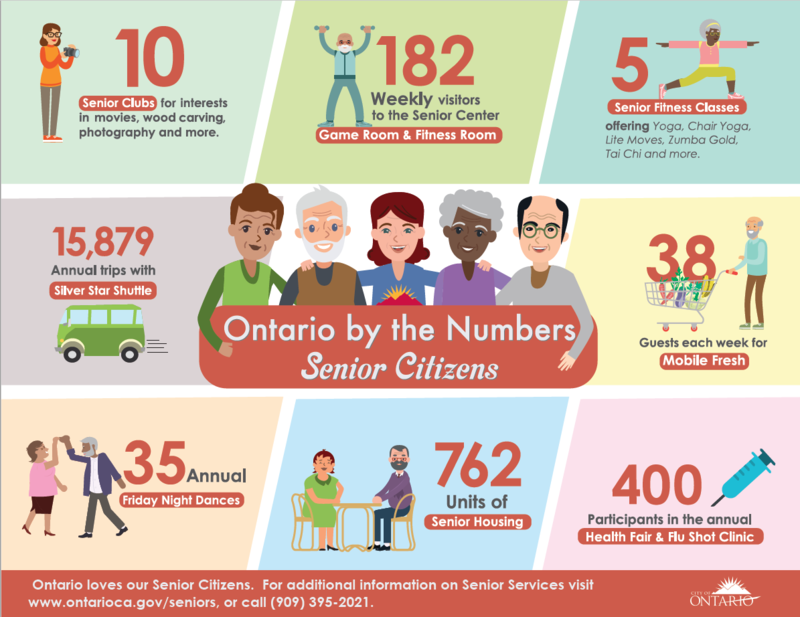 We are proud to offer multiple services for our Ontario senior citizens. The Senior Center offers a variety of programs, activities and classes that accompany the traditional programs that many in our community have come to depend on. For questions about joining our clubs, activities and programs please call us at (909) 395-2021. The Department of Aging and Adult Services (DAAS) is a San Bernardino County Agency dedicated to helping seniors. To find out more, visit hss.sbcounty.gov or call (909) 891-3900. Senior Meals (60+) are served Monday - Friday, 11:30 AM - 12:30 PM at the Senior Center, located at 225 East B Street. Suggested donation for meal is $2.50. City of Ontario and YMCA present Senior Transportation for Ontario Residents. Pick-up at and Ontario Residence. Drop-off at the Ontario Senior Center. To schedule transportation, contact the YMCA and leave a message at (909) 988-1864. Omnitrans is the public transit agency serving the San Bernardino Valley. Seniors 62 and older qualify for a discounted rate on fares and bus passes. To find out more, visit OmniTrans. Can’t find something or need an answer to a specific question? Email: [email protected] this email is monitored Monday - Friday from 8 AM - 5 PM.